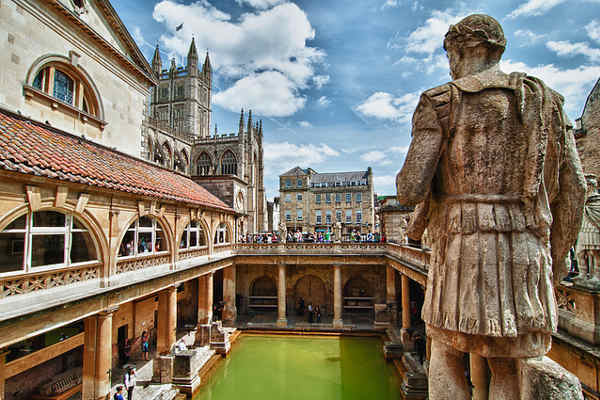 The City of Bath in Somerset was first founded by the Romans in the 1st century AD as a thermal spa. Today, Bath is an elegant world heritage site, with neoclassical Georgian buildings constructed from the famous Bath Limestone. You are sure to find many things to do in Bath for all the family. However, the Roman baths, theaters, museums, and a wealth of history make this city a cultural tourists dream. The shopping, restaurants, and nightlife, also have a unique local charm. In this article, we will look at the main tourist attractions and things to see in Bath. With all the interesting things to do in Bath, the most famous is undoubtedly the ancient Roman baths from which the city took its name. What better way to start our list of things to see, than this historical wonder. The Ancient Roman Baths, are the most well-persevered example of an ancient Roman spa complex in the world. They were constructed by the Romans around 60-70 AD, at the site of a Celtic shrine to the goddess of the thermal spring: Sulis. 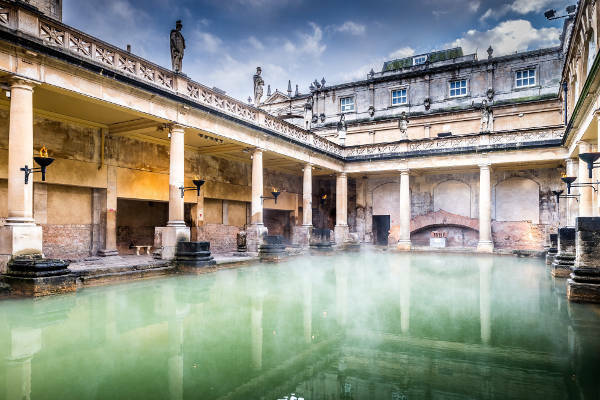 In fact, the Romans used the name of the Celtic goddess as the founding name of the city: Aquae Sulis, which means ‘the waters of Sulis’ in Latin. The Romans themselves recognized this god by the name Sulis Minerva. Archaeologists have found evidence of human activity at the site of the thermal springs from around 8,000 years ago. What is there to see at the Roman Baths? You can view the Roman Bathhouse facilities, part of the ancient sacred spring and the Roman Temple dedicated to Minerva Sulis. An onsite museum displays artifacts of Roman and Celtic origin which were found locally, along with Roman models and costume replicas. You can also purchase souvenirs in the Roman Baths gift shop. The Baths are now below modern street level, but there is also a Georgian Pump Room at ground level, which is currently used as a restaurant. The Romans used lead to line the bathing chamber of the ancient Roman Bath complex, and lead pipes were later used to provide water from the springs. This has created a health hazard from lead toxicity in the Baths. There is also a risk from waterborne bacteria, so bathing and drinking are now prohibited at the historical facilities. However, you can drink the spa water at the restaurant, which is provided from a clean and safe modern borehole. A free glass can be sampled on the production of a Bath Spa ticket, or purchased for 50p a glass. You can also sample the safe supply of water from the drinking fountain at the exit to the Roman Baths. To swim in the waters heated from the thermal spring you will need to visit the Bath Spa Project. See below. The Roman Baths are located right in the center of Bath, and they have been central to the social and cultural hub of the city for centuries. Bath has good coach and rail connections from most major cities in the UK. The Roman Baths are 5 Minutes walk from Bath Spa Train Station, and Coach Station, which is located close to each other on the River Avon. 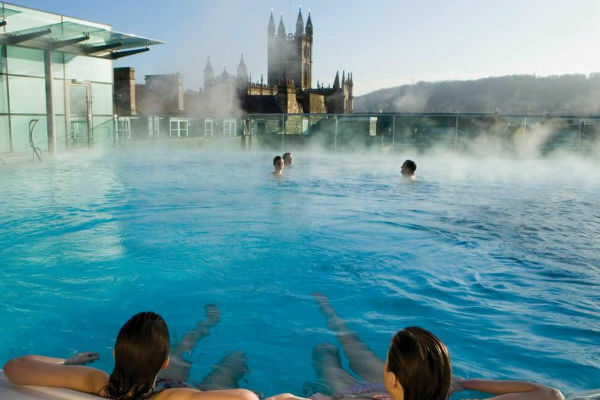 The Thermae Bath Spa project is a public bathhouse and spa facility opened in 2006. The idea was to allow visitors to experience the waters heated by the cities famous geothermal springs. The same springs provided heated water to the Roman Baths which patrons had used to bathe until the late 1970’s. Health and safety issues eventually forced the closure of the public bathing access. The new Thermae Bath Spa project has several buildings. The main spa at the New Royal Bath building is constructed from Bath stone and shrouded in a glass cube. There are two geothermally heated baths, including a spectacular roof pool with city views. A range of spa treatments is offered including massage, hot body stones, facials, watsu and other treatments related to the thermal waters. The building also houses the wellness suite, with its ice chamber, Georgian & Roman Steam rooms, relaxation rooms, the Springs Cafe Restaurant, a shop, and a visitors center. The Cross Bath is a separate spa located in a Georgian building just one minute walk from the main spa. The cheapest entry price for the New Royal Spa is a deal called the ‘Thermae Welcome’. A 2-hour spa session and use of towel, robe & slippers. The treatments range in price from £10 up to £130 and there several package deals costing up to £199. The Famous English novelist Jane Austen lived in the city of Bath from 1801 to 1806 with her parents, brothers, and sister. Austen is famous for her seven highly acclaimed works of published fiction which included Sense and Sensibility (1811), Pride and Prejudice (1813), Mansfield Park (1814) and Emma (1815), all of which mention Bath. Austen also wrote the novels Northanger Abbey and Persuasion with Bath as the backdrop. It is believed Jane Austen started her novel The Watsons while living in Bath, which unfortunately was never finished, probably due to her father’s death. The Austen’s lived in several homes within Bath including 25 Gay Street. It is at a similar grade II listed Georgian townhouse at 40 Gay Street which houses the Jane Austen Centre. 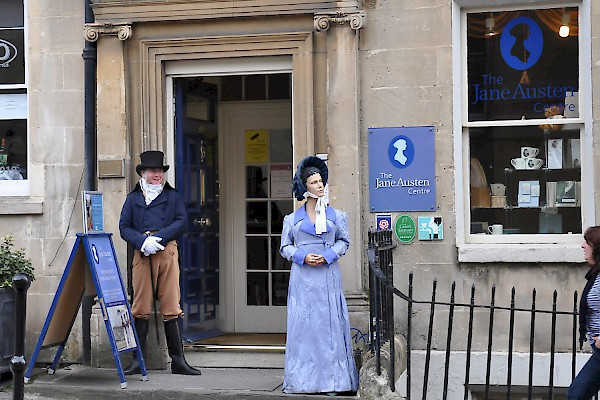 An essential thing to do in Bath for all Jane Austen enthusiasts. The Jane Austen Centre concentrates on the authors time in the city and how it influenced her work. The staff dress in period costume to give the centre and authentic time-warp feel. Visitors are also given the opportunity to dress up and have pictures taken. The centre has a waxwork figure of Jane Austen which it had commissioned by an internationally-renowned sculptor, an FBI-trained forensic artist, and a Bafta and Emmy award-winning costume designer. You can visit the Regency tea room at the centre for afternoon tea served by quaintly dressed serving staff. The tea room is open to the public and a Jane Austen Centre ticket is not required for entry. A Jane Austen themed gift shop sells period reproduction souvenirs for a memento of your visit. Discovery cardholders receive 10% discount on entry tickets. Children under 6 go free with an adult. Doris Langley Moore was a novelist, a costume designer, a Byron scholar and a friend of George Bernard Shaw. Her study, collection, and curation of period costumes made her one of the first significant female fashion historians. In 1963 she donated her extensive costume collection to the City of Bath for the formation of fashion museum in the Assembly Rooms. Every year since the museum’s inception in 1963, the fashion museum has asked a leading industry expert to choose a dress of the year to add to its collection. Over the years some the worlds leading authorities on fashion have chosen dresses for the fashion museums dress of the year; experts such as Giorgio Armani, John Galliano, Ralph Lauren, Alexander McQueen and Donatella Versace. 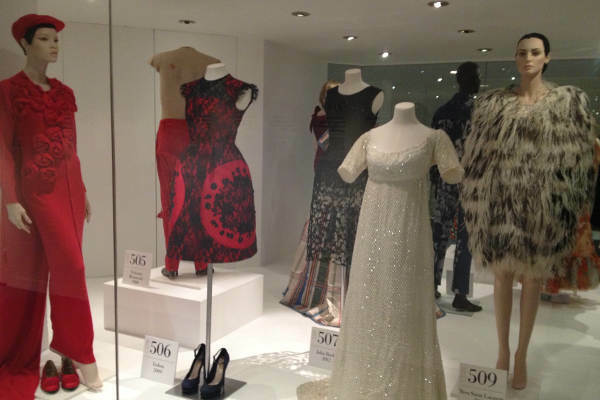 Today the Bath fashion museum has over 100,000 objects, which it displays in various exhibitions covering different fashion topics and themes. The oldest objects in the collection are from the early 1600s, and you will find fashion items right up to present day contemporary pieces. In a recent shoe exhibition, you could view Georgian silk shoes alongside Nike Air trainers. You can also visit the museum shop, or take a bite to eat in the café. Open every day from 10.30am, except 25th and 26th December. House No.1 Royal Crescent, is the first building at the eastern end of the Royal Crescent in Bath. The street is a row of 30 terraced townhouses in a crescent-shaped arc overlooking parkland. House No.1 is a building of historical and architectural importance. The house consists of a Georgian “historic house” museum, which is decorated and furnished using genuine historical furniture, paintings, decorations and other items depicting Georgian domestic life both for residents and domestic staff. The museum’s mission is to transport the visitor back in time, to show how a house would have looked between 1776-1796, and it does an excellent job at achieving this goal. 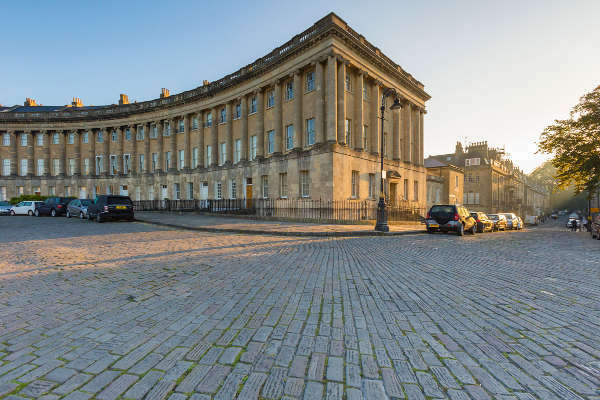 The city of Bath during this period was home to a fashionable and influential social set, and the house at Royal Crescent was its finest location. The museum displays how the upper echelons of Bath society lived, as well as the staff that maintained, cleaned, cooked and assisted the wealthy residents. 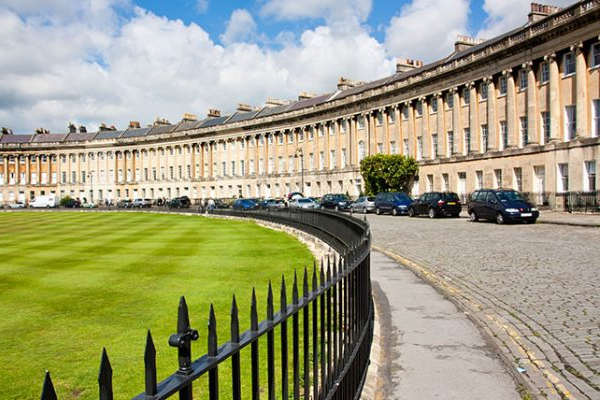 The Royal Crescent was designed by the architect John Wood, the Younger, and built between 1767 and 1774. No.1 is a Grade I listed building and among the greatest examples of Georgian architecture in the United Kingdom. Wood designed the Crescent as a proto-romantic set-piece interacting with the countryside. At the time of its construction, the location was on the outskirts of the city was surrounded by fields. The house underwent a major renovation project between 2012 and 2013 which reunited No. 1 with its original service wing at No. 1A, from which it had been separated during the 20th century. Although No. 1 has undergone a lot of internal modification and construction over the years, the Georgian stone façade remains much the same as when it was first built. The museum is operated by the conservation charity, The Bath Preservation Trust which was set up in 1934 to safeguard the historic city of Bath. The charity headquarters are also located in No.1 Royal Crescent. There is a gift shop at the museum where you can buy souvenirs and merchandise related to the house and the city of Bath. In 2018 the museum is open every day until 1st January 2019, except Christmas Day and Boxing Day. Visitors with a valid BANES Discovery Card are entitled to a 50% discount, and children attend for free. We hope you enjoyed this article on Bath tourist attractions. Feel free to leave feedback below.